Greece votes "no" in referendum: Here's what Athens looked like. Crowds celebrate in front of the Greek parliament Sunday night in Athens, Greece. ATHENS, Greece—For a vote that could help sever Greece from Europe’s monetary union, in many ways Sunday’s referendum amounted to little more than a moment of national theater. Few Greeks knew, much less understood, what they were voting on. A “yes” vote technically indicated support for agreeing to bailout terms made by Greece’s European creditors last Saturday—terms that German Chancellor Angela Merkel has since declared invalid. To many voters “no” meant not a rejection of those terms, but a rejection of the eurozone itself. Voter turnout across Greece was enormous. Around 8 p.m. I was sitting in Steki Bar in Exarcheia, a leftist neighborhood of Athens within sight of the Acropolis, when results started streaming in on the Greek news channel Skaï TV. Almost no one around me was actually Greek. Most were social activists—from New York, from Berlin, plus a guy from Dublin named Che—who watched in disbelief as even the most conservative redoubts of Greece—the Peloponnese, Boeotia —turned a deep shade of orange on the on-screen map. “No” had won overwhelmingly. Immediately Antonis Samaras, the head of New Democracy, Greece’s center-right party, resigned. Cries of victory erupted; drinks were bought. “It will go down as a holiday for the Greek left,” a friend declared. 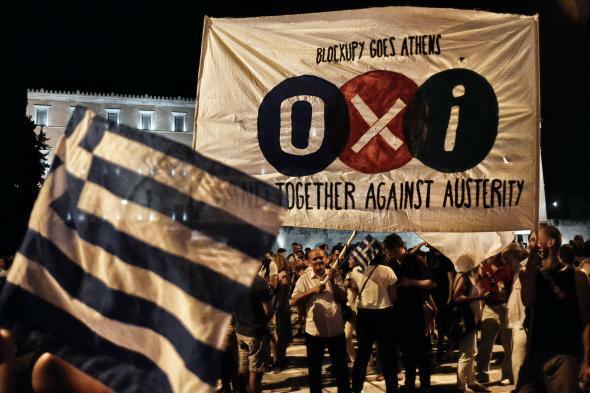 All together we marched the six blocks to Syntagma Square, a hand-painted OXI!—No!—banner flapping above us. Nikos Voutsis, the interior minister of Greece’s ruling, left-wing Syriza party, joined us on Panepistimio Street. “A big step for Europe,” he informed a pack of international journalists. Yet virtually no one I encountered in the crowd was willing to acknowledge why “no” had won. It was not because Syriza activists had spent the week working the streets; they hadn’t. It was not because Greeks actually want a rupture from the euro; they don’t. “No” won by 22 percent in part thanks to the work of the far-right elements of Greece—including the neo-Nazis of Golden Dawn—that are eager to see the European Union dissolve into its various nation-states. * Syriza would never have secured its “No” without these types. The greatest threat to Syriza within Greece right now may not be the complete lack of liquidity or the devastating state of public services, but just this: Its own dependence on the Greek far-right, including its coalition partner Independent Greeks, to bolster its opposition to the European Union. Monday will show whether the party intends to confront the concept of European integration as gravely as Greece’s far-right elements would have. *Correction, July 6, 2015: The post originally misstated that “no” won by a margin of 11 percent. It won by 22 percent.